Yamaha has launched the 250cc FZ in India at Rs 1.19 lakh, ex-Delhi. The Yamaha FZ25 street fighter motorcycle is available in three colours - Blue, White and Black. The motorcycle is made in India at the company's Surajpur plant. The 250cc market while new for India has been in use in another markets namely Japan. The Blue Core-enabled two-valve SOHC engine makes 20.9PS@8,000rpm and torque of 20Nm@6,000rpm. The engine is mated to a 5-speed gearbox. Yamaha claims that the motorcycle will deliver a fuel efficiency of 43kmpl. The kerb weight of the Yamaha FZ25 is 148kg. The motorcycle looks similar to the FZ16 but has a more beefed look. It has a full LED headlamp and taillamp. The LCD meter console is new and has the usual tell tale lights along with an average fuel consumption analysis. The mirrors look similar to the ones on the MT-03. The 14l fuel tank looks chiselled and also has extensions. The overall length is slightly longer than the FZ16 at 2015mm and has a seat height of 795mm. The ground clearance is 160mm. Stopping power is via a 282mm front and 220mm rear disc brake. There is no ABS at the moment but Yamaha says that they are ready should there be a demand for the same. Suspension is via hydraulic dampers at the front and a pre-load adjustable monoshock at the rear. 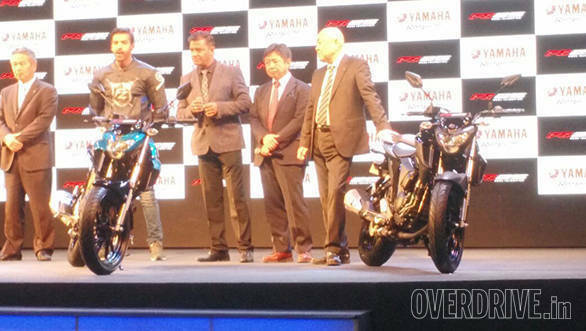 Yamaha aims to move around 4,000 units each month of the FZ25. The motorcycle will be in showrooms in a few weeks time and will be competing with the Pulsar 200NS, TVS Apache RTR 200 4V, KTM 200 Duke and the Bajaj Dominar 400.